Transplanting hair grafts and scalp flaps are 2 of the more innovative and modern surgical procedures for hair replacement being employed today. Both of these are extremely effective where replacement of lost or thinning hair is concerned and have become extremely popular over recent years. There is a recovery period and certain precautions to be aware of once you have had a surgical hair replacement procedure performed. You want to be sure and follow these recommendations and the recovery should proceed smoothly. Take a baseball cap to wear after the surgery is done – do not use a fitted one. It must be adjustable. The cap will help you avoid any damage to the affected scalp areas and help to prevent any infection from occurring. Although the surgical hair grafts will be clearly visible after your surgery, you’ll want to keep the cap a bit looser than you would normally wear it, because if it is too tight, it will restrict blood flow which will eventually damage the hair grafts. Make sure you follow the physician’s instructions on each of these medications. This will ensure that they work properly and there are no complications. Leave your hair alone for up to 2 days – this includes shampooing it after you have had the replacement surgery performed. After a couple of days, it should be alright to shampoo the hair but you want to be careful for the next couple of weeks as well. Be gentle when you are shampooing and try to refrain from normal scrubbing like you would have done prior to the procedure. Keep the scalp protected and covered for up to 2 weeks – you want to avoid direct sunlight and covering the hair will help with that. You also want to stay fairly inactive for the first 2 weeks after the surgery. Normal chores and shopping are okay but no strenuous exercise is allowed. Leave the scabs alone – grafted areas are always going to scab over after the hair replacement surgery and they will inevitably start to itch. This is a good sign that the surgery is healing properly. They should start falling off within 1 to 2 weeks, but if they don’t, shampoo your hair a little more vigorously. To begin with, most of the hair replacement surgeries are held in the surgeon’s facility or as an outpatient based center. Only in rare cases, it might require hospitalization. Irrespective of the technique used, all of the replacement of hair procedures are conducted under local anesthesia and may require sedation for higher relaxation. Even though you may not feel the pain, tugging and pressure can be felt during the surgical operation. However during flaps and advanced surgical grafting procedures, general anesthesia is given. Apart from the punch grafting technique, there are other hair replacement methods that use grafting as a method to re-grow hair on spots where there is thinning of hair. Though there are numerous types of grafts that are done for hair replacement procedure, basically the surgeon uses a scalpel and cuts a small section of the scalp with hair. This small portion of the hair bearing tissue is further dissected and then transplanted into slits within the scalp. During the operation or surgical process, three is periodic injections of salt-saline water to ensure that the skin strength is maintained and the skin does not wrinkle. Most of the donor graft areas are closed with stitches. The punch holes need just one stitch while the larger flap graft areas require straight line stitching. Sometimes it results in wide scars. Usually these scars are concealed with the hair surrounding it. With a multitude of hair replacement products for topical application and surgical means in the market today for those suffering with hair loss, choices are many. In most cases, replacement of hair requires a certain amount of follicles transplantations that are taken from the donor area to be implanted on the patch of bald spot on the scalp. With innovative techniques and advancements of surgical procedures, each of the hair replacement procedures has its own advantages and disadvantages. Here are the top techniques used in replacement of hair for men and women in recent years. One of the latest techniques in replacement of hair surgeries, NeoGrafting uses the state of art NeoGraft Transplant machine which selects the donor hair follicles and extracts it to implant them on the required scalp region of the recipient. The main advantage of this surgical procedure is no suturing, stapling or use of the scalpel. Although there is minor scarring on the specific transplanted area there are no linear scarring as in other traditional methods of hair replacement surgery. The options available for hair replacement have increased manifold especially when appearances are everything for men and women today. It is not only cosmetic but the loss or thinning of hair can affect the individual psychologically. With non-surgical hair replacement techniques and products available, more people with thinning hair or balding issues opt for these methods. Apart from surgical replacement of hair, there are numerous topical applications that have known to benefit the growth of hair and are sought after commodities for both men and women alike. However, with the benefits come some side effects that you need to consider before application. 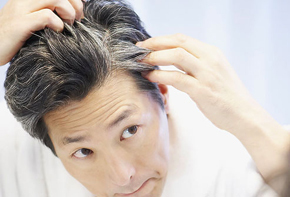 One of the most popular hair replacement topical applications includes Minoxidil or which is better known as Rogaine. It has proven to be effective for both men and women and is one of the most prescribed applications in non-surgical use. However, the most surprising fact remains that Rogaine was used as a medicine for the treatment of hypertension. Intensive research was conducted on the side effects of the medicine and it came out that there was lush hair growth in individuals being treated for hypertension. Thus, a new medicine, Rogaine (Minoxidil) for the treatment of hereditary baldness and thinning hair was introduced in 1980s. Initially it was only for men but constant good results led to its wide spread applications for women non-surgical hair replacement issues.